Tungamah is a rural town north-east of Melbourne, approximately 29 km from Yarrawonga and the Murray River. It is situated on slightly undulating land which is surrounded by almost treeless plains. Tungamah is on the Boosey Creek which has light woodland along it. Lightly wooded country extends south and east of the town. Tungamah was named after an Aboriginal word thought to mean wild brush turkey. The township was gazetted in 1875, when pastoral runs were being made available for closer settlement. In 1876 a school was opened, and within seven years Tungamah was described as a flourishing village with a post office, three stores and two banks. Situated in Yarrawonga shire, Council meetings had been removed from Yarrawonga to Tungamah. 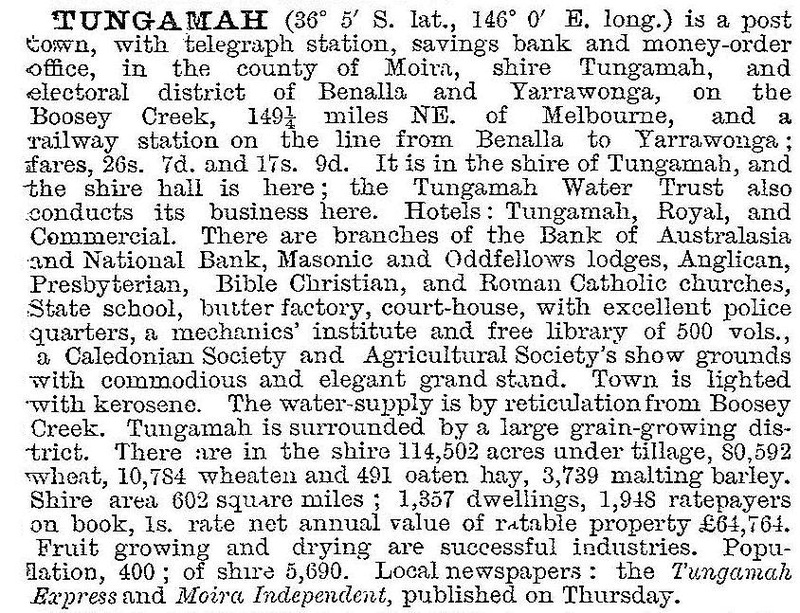 The following year (1884) Tungamah had five stores and five hotels. 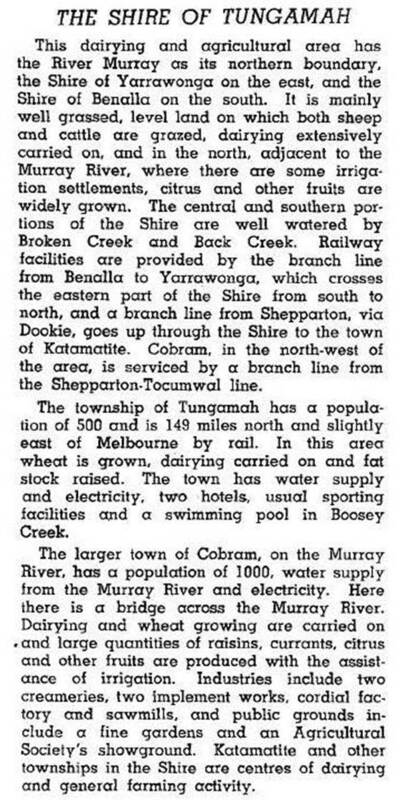 On 1 April 1953, Cobram shire was severed from Tungamah shire. The slow decline of the township since the turn of the twentieth century has resulted in many of the surviving buildings retaining their original outline or appearance. Examples include the three churches on the hill north of the town (Presbyterian 1885, Catholic 1886 and Anglican 1889), former Colonial Bank (1880), Masonic Hall (1890), Phillips and Costigans general stores (1883 and 1889), the hotel (1891), mechanics' institute and court house (1890), the post office and the water tower (1909). A Tungamah Central Area conservation study was done in 1983, but nothing has been placed on a historic buildings register. A recent building is the new shire offices (1964). A recent building re-use is the pre-school activity in the former court house. Tungamah also has a recreation reserve, a swimming pool, tennis courts and a bowling green. The school had an enrolment of 36 pupils in 2014. In 1994, 97,608 ha or 85% of the shire's area was farmed. Livestock numbered 153,000 sheep and lambs, 31,000 dairy cattle and 8600 meat cattle. Cereals were planted on 17,020 ha and 25,700 tonnes of wheat were harvested. On 18 November 1994, most of Tungamah shire was united with Cobram, Nathalia and Numurkah shires and most of Yarrawonga shire to form Moira shire.